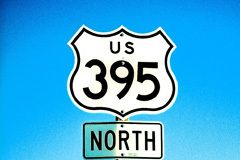 The easy drive to Mammoth on U.S. 395 is one of California's most scenic drives. Coming from the south on 395 (Los Angeles, San Diego, Orange County) brings you through Bishop, Lone Pine and the famous Mt. Whitney. Coming from the North on 395 (Reno, Lake Tahoe, San Francisco) takes you by or through Yosemite National Park, Bridgeport and Mono Lake. Check out the map below and the driving distances from major cities for more information, and be sure to check the road conditions if you are plannign a winter trip! Once in town, you'll need to find us. Check-in time is 4pm. We're located at 1914 Meridian Boulevard in the Mammoth Sierra Properties Building, across from Vons grocery store.